This summer, Broadmeadow's going casual. Don't worry about how you look or what you're wearing. Just show up. We're excited to have you. Heck, Jesus wore sandals. Throughout the books of 1 & 2 Samuel, we are invited to see God's radical grace at work in unexpected ways. The stories of Samuel's call, David's unlikely anointing as king and victory over Goliath, and his the lesser-known elegy where David mourns Saul and Jonathan and his official kingship is over all of Israel highlight the unexpected ways god is actively working among God's people. It is a challenge to our present-day lives as we perceive God working among us - calling us, responding to us, seeing us, leading us, saving us, and uniting us, even today. 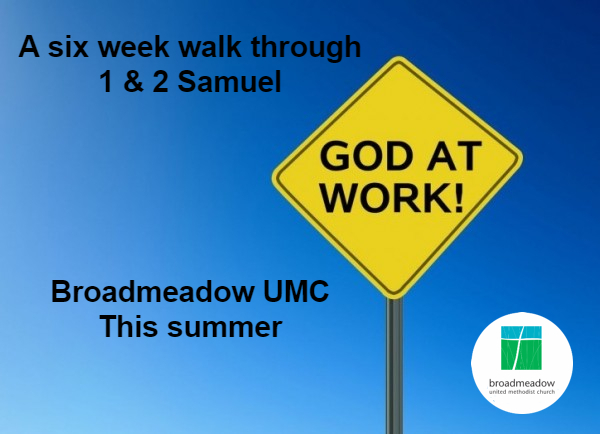 Come worship with us the next six weeks as we see "God At Work." Most of us have experienced signing some kind of contract or legal document. If you want to borrow money, buy a car, or rent an apartment, you have to sign on the dotted line. Contracts are built on distrust; on protecting ourselves in the event that the other party doesn't hold up their end of the bargain. Yet, healthy human relationships are built on trust, and we can only trust when we make ourselves vulnerable. The deepest and most eternal trust that undergirds our souls comes from a relationship with God, who has given all to be with us and keeps not only God's promises, but ours as well, in an unbreakable love known as "covenant." You're invited to join us this Lenten season as we discuss trusting in God's everlasting covenant with us! You're invited to join us as we begin our Lenten journey on Ash Wednesday. Epiphany Sermon Series - "Jesus: Man of Mystery"
As Jesus' public ministry began, he remained a somewhat mysterious figure. He played things close to the vest and revealed things only when he was ready. So, who was he? Who IS he? You're invited to join us at Broadmeadow in this season after Epiphany as we explore "Jesus: Man of Mystery." See, Advent is all about waiting. And, seriously, who likes waiting? Sure, we like the things we're waiting for. In this case, we love Christmas. We love the lights, the presents, the carols. But, waiting for those things? Blah. So, most of us just don't. We skip right to Christmas. We start singing "Joy to the World" as soon as Thanksgiving's over (or, maybe Halloween). But, Advent is important for the very reason we'd rather not deal with it. Advent makes us slow down in a season that tempts us to run at full speed. Advent invites us to notice things we would rush right by. Look, I'm not going to try to tell anyone not to listen to Christmas music until December 24. It's already playing around my house. But, I do hope that you pause. I hope that you breathe. I hope that you take a moment to notice God in the busyness of the season. One thing I hope all of you do is bring one new person to church with you this month. Just one. It can be a friend, a relative, a neighbor, or a complete stranger. Invite them to slow down for just a moment and join you in the expectation and excitement of Advent. The coming of Christ into the world plays out like an epic movie. We watch and wait with excitement and expectation. 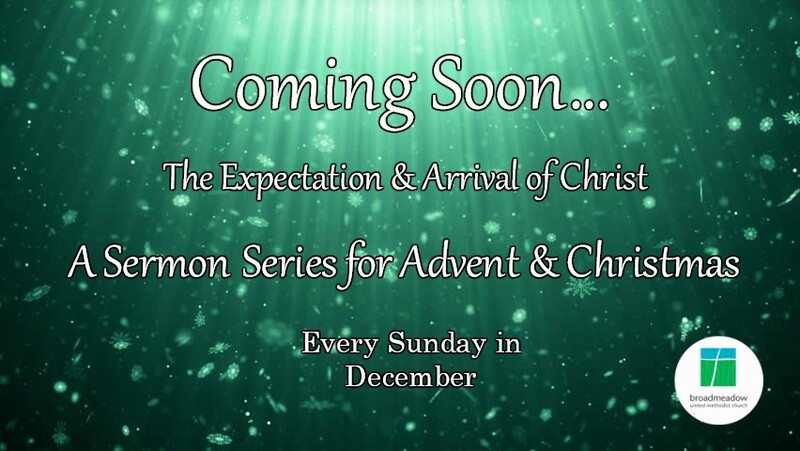 All December, through the seasons of Advent and Christmas, we'll be excitedly watching and waiting together. You're invited to join us at Broadmeadow all through December for our series: "Coming Soon..."
"Death & Other Good News"
People have a difficult time talking about death. People in the Church are no different. We do just about anything we can to avoid the topic. And, yet, even in death...especially in death, followers of Jesus find hope. Join us at Broadmeadow UMC from All Saints until Reign of Christ Sundays as we talk about "Death and Other Good News."